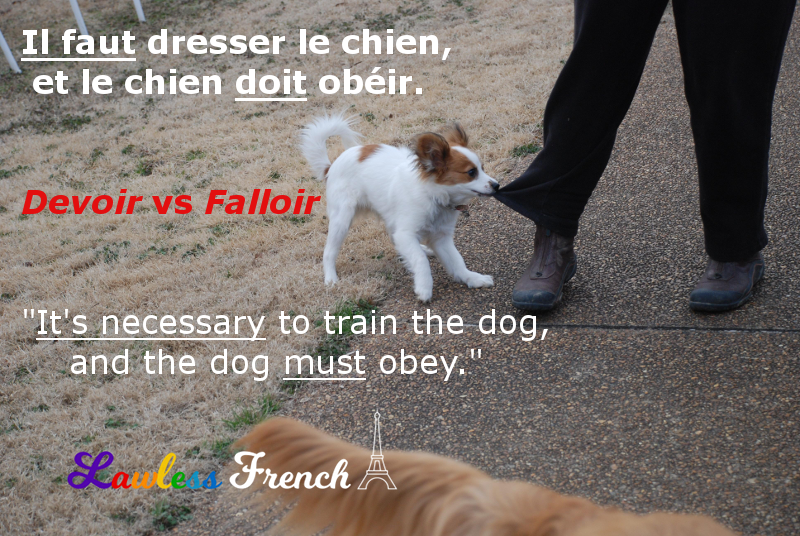 Devoir and falloir are fairly synonymous, but these two French verbs are not interchangeable. Their meanings are slightly different, and they each have additional meanings, depending on how they’re used. This lesson addresses only the overlapping meanings; for more info, see the individual lessons. Devoir plus an infinitive indicates an obligation or duty. Je dois travailler. I have to work, I must work. Je devais travailler. I had to work. Elle a dû le finir. She had to finish it. Paul doit aller au bureau. Paul has to go to the office. The impersonal verb falloir indicates a need or necessity, and can be used with the infinitive or subjunctive. Il faut que je travaille. It’s necessary that I work. Il fallait travailler. It was necessary to work. Il a fallu le finir. It needed to be finished. Il faut que Paul aille au bureau. It’s necessary for Paul to go to the office. The difference between these verbs is a question of obligation vs necessity, and it’s more than just semantics. Devoir indicates something that a person is obliged to do, a duty, while falloir expresses something that needs to be done, a necessity. Je dois m’en aller. I have to leave. I’m obliged to leave (for my own reasons/morals). Il faut que je m’en aille. It’s necessary that I leave. Someone or something else requires me to leave. So devoir focuses on the actor, and falloir on the action – yet the end result is often the same. It’s just a matter of whether an individual has to do something, or if the most important thing is just that it gets done. Il faut dresser le chien. It’s necessary to train the dog. Focus on the training. Le chien doit obéir. The dog must obey. Focus on the dog.